The Roos have run out big 54 point winners over the Demons, after being challenged early in the game. The Roos took control in the second half and put the result beyond doubt. GOAL KANGAROOSTarrant is taken over the shoulders and is awarded a free kick 40m from goal. He comes in and kicks from the pocket, it is a great kick and it goes through for a goal. GOAL DEMONSSylvia finds some space in defence, as he marks 25m from goal. He comes in and kicks a late consolation goal for the Dees. What a sight! Campbell takes possession of the ball from defence, he runs down the ground and takes seven bounces, takes a shot from 50m and it runs out of steam. BEHIND DEMONSBlease breaks away, has a shot for goal but he is off target. Percentage is a big focus for the Roos and they will be playing every second of the game in a bid to bolster their percentage. GOAL KANGAROOSThomas uses his body well to mark the ball from Sellar, he plays on runs into the goal square and kicks a goal. The Roos have one objective for the rest of the home and away season and it is to continue winning and sew up a spot in the top eight. BEHIND KANGAROOSThe Roos go coast to coast as the ball ends up with Tarrant who kicks a point. BEHIND DEMONSBail marks 45m from goal on a 45 degree angle. He starts it out right and it stays there. BEHIND KANGAROOSWright puts it onto the left boot and can only manage a minor score. BEHIND KANGAROOSHarper takes an overhead mark on the lead 35m from goal. He takes the set shot on goal and pushes it away to the left. The Roos take it out of defence and they have runners everywhere. A goal should result from here. GOAL DEMONSSylvia takes the mark just inside the 50, near the boundary. He decides to take the shot on goal and he kicks it beautifully for goal. Gibson has had the most disposals in the game, with 30 touches. The best for Melbourne is Jones with 26 touches next to his name. GOAL KANGAROOSThomas kicks it around the corner and finds Petrie taking the mark on the edge of the goal square. He kicks his fourth goal of the day. North Melbourne will be further cementing their spot in the eight and all of a sudden, Essendon's spot is looking very shaky. GOAL DEMONSGreen is awarded a free kick for a clip on the ear by Firrito. He kicks from 10m out and kicks it around the corner for a goal. The Demons can't wait to file season 2012 away and start planning fresh for season 2013. GOAL DEMONSSylvia reads the flight of the ball well and marks it on the edge of the goal square. Sylvia kicks an easy goal. GOAL KANGAROOSHarper takes it with hands, looks up at goal and kicks it straight through the middle. The Roos lead by 60 points. BEHIND KANGAROOSThe Roos are awarded a free kick for another deliberate out of bounds. Tarrant takes it 30m from goal and kicks it across the face of goal. Thompson kicks it hard to the lead of Petrie, who marks it overhead. He attempts to improve the angle and misses the lot. News coming out from the rooms that Adams is being assessed and will not take any further part in the game. The ball is bounced to get us back under way for the final term. The Roos go into the final break holding a dominant 53 point lead over the Demons. 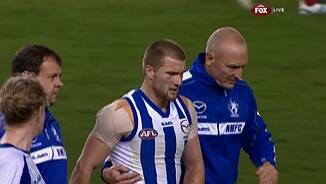 Bad news for the Roos as Adams looks to have injured his much talked about shoulder behind play. He comes off the ground with the help of the trainers. The Roos have one final chance to add to their score. GOAL KANGAROOSPetrie gets the front position from Frawley and marks in the corridor. He takes the shot on goal and it comes around for a goal. Frawley does well to intercept the low pass to Petrie and thwart another Roos attacking play. 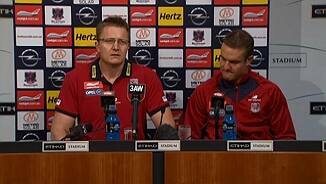 The Dees have brought the margin back to 47 points, but don't look like causing an upset. GOAL DEMONSGreen runs around and finds some space, taking the mark 15m from goal. He kicks his second goal of the day. SUBSTITUTION DEMONSThe Dees have decided to end Jetta's game by substituting him out of the game and giving Strauss an opportunity to impress. BEHIND KANGAROOSCampbell gathers the loose possession, looks up at the sticks but can only manage a point. BEHIND KANGAROOSThe Roos have been awarded a free kick 20m from goal, for a deliberate out of bounds from the Dees. Harper takes it and hits the post. The Demons will need to show more of the pressure they put on the Roos in the second term more regularly, as they are showing glimpses of a good side. The Roos have gone bang, bang, bang and have pretty much sealed the game. However they need to build on their percentage, which is important on the run home to the finals. 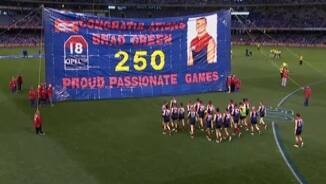 GOAL DEMONSGreen comes out and takes the mark 40m from goal, he takes the set shot and kicks a goal in his 250th game. BEHIND KANGAROOSWright takes a long range shot on goal, Thomas attempts to mark it in the goal square but it slips through his hands. BEHIND KANGAROOSAnthony has a quick shot on goal from 50m and pushes it away to the right. The Roos lead by 56 points. SUBSTITUTION KANGAROOSThe Roos have rolled the dice and taken McMahon out of the game and have injected Campbell into it. GOAL KANGAROOSHarvey is awarded a free kick for a deliberate out of bounds by Dunn. He kicks from 45m and kicks his 400th goal. Congratulations Boomer! GOAL KANGAROOSAdams is awarded a free kick for an over the shoulder infringement against the Dees. He kicks from 20m out and splits the middle. North Melbourne are out to a 43 point lead with the Demons in desperate need to score the next goal. The Roos forward line will be starting to be of concern to many top eight sides, as they have three capable forwards who work well in tandem with each other. GOAL KANGAROOSTarrant comes out and takes a strong overhead mark. Dunn pushes Thomas behind play and gives away a 50m penalty. Tarrant kicks his third goal. GOAL KANGAROOSThomas gathers it deeps in the pocket, he snaps for goal and makes a difficult shot look so easy. GOAL KANGAROOSAdams mops up the spill of the ball, runs closer to goal and delivers just what the Roos wanted, a goal. We are back under way for the second half as the Roos get first hands to the ball. The Demons win the quarter by a point but still trail the Roos by 25 points at the main break. BEHIND KANGAROOSFrawley is swamped upon, as he manages to get the handball out over the goal line for a rushed behind. The Roos push it into attack, as the Dees are under immense pressure to stop them from scoring a goal. BEHIND KANGAROOSThe ball comes off hands and is pushed through for a rushed behind for the Roos. GOAL DEMONSHowe puts it into the path of Jones, who gathers and shoots for goal to bring the Demons back to within 23 points. There is more than enough time left for the term, for either team to score a goal, as the ball is inside the Demons forward line, they have the best opportunity. It has been a great quarter by the Demons, but in saying that, they still trail the Roos by three points in terms of the second term. BEHIND DEMONSBail has a shot from the boundary and just cannot get the accuracy. GOAL DEMONSGreat mark by Stefan Martin in front of Grima, 30m from goal. He kicks a much needed Melbourne goal. GOAL KANGAROOSAdams centres it from the boundary, to an unmarked Petrie, 20m from goal. He kicks his 45th goal of the year and the Roos are on the march. All of a sudden, two quick goals by the Roos, has taken the margin back out to 30 points. GOAL KANGAROOSTrengrove turns it over as it ends up into the hands of Harvey and Boomer kicks a goal around the corner. GOAL KANGAROOSPetrie delivers it onto the chest of Tarrant, marking 25m from goal on a slight angle. He kicks his second goal of the day. BEHIND DEMONSBail gathers it from the kick in, kicks around the corner and misses. The Dees are not making the most of their opportunities. BEHIND DEMONSThe tide is turning, as Green leads up and takes a strong contested mark 40m from goal, he takes the set shot and hits the post. GOAL DEMONSGarland works off his man, gathers the loose ball 45m from goal and kicks another goal for the Dees. GOAL DEMONSHowe manages to extract the free kick for being held onto, he kicks from 40m and threads it through. The Dees have dominated play all quarter but yet to put any proof onto the scoreboard. GOAL KANGAROOSTarrant gets off the leash and takes an overhead mark in front of MacDonald 30m from goal directly in front. He kicks his first goal of the day. This is starting to become a scrappy contest, with neither team looking likely to post a score onto the scoreboard. Sam Gibson is enjoying himself on the ground, with 15 disposals. 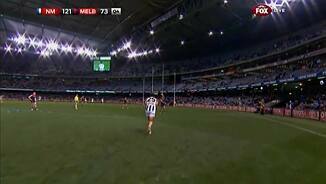 Great pressure by the Melbourne Football Club, but they need to now put an impact on the scoreboard. The Dees clear it away from the last line of defence and they are away from danger. Rivers is playing as a loose man across the forward line, which only means that the Roos also have a loose man up the field. We are back under way for the second term, in where the Demons must get the first goal, if they want to remain in the contest. The siren sounds to end the first term and the Roos are out of the blocks early and lead the Demons by 26 points at the first break. The Dees are building something through the middle, if they can get a late goal, it would certainly be encouraging for them. The Roos looks to have slowed down their intensity, as the Dees start to creep back into the game. BEHIND DEMONSSylvia was like a magnet to the ball, as it went straight through to him 41m from goal. He comes in and pushes it away to the left. GOAL DEMONSRivers gives it to Garland who hands it off to Blease, kicking a goal around the corner. GOAL KANGAROOSThomas kicks it over the top of the pack, to Petrie who is on his own he runs onto it, gathers it 5m from goal, steadies and goals. BEHIND DEMONSGarland works himself into position, as he gathers the bouncing ball 40m from goal, has a shot under pressure and just squeezes it through for a point. Wells is starting to see a lot of the ball, with seven disposals already. At this rate, he is on track for a near 50 possession game. BEHIND KANGAROOSWells is on the burst, he takes three bounces, he looks for a pass up forward, nothing eventuates, so he decides to have a go but he pushes it right. It is all one way traffic here today, with the Roos putting a performance reminiscent to the way that the Hawks played last night. BEHIND KANGAROOSHarper gathers the loose ball, he sends it home for goal and hits the post. Jones with a brilliant tackle on Cunnington just as he was making plans of getting amongst the goal kickers. GOAL KANGAROOSSwallow marks in the centre square, Howe infringes the mark and the umpire awards a 50m penalty. Swallow kicks an easy goal from 40m out directly in front. GOAL KANGAROOSAnthony looks to pass to Tarrant in the goal square, he is shoved off the ball by Sellar and it bounces through for a great 55m goal. BEHIND KANGAROOSGoldstein once again finds Bastinac on the lead and gets him 35m from goal on a slight angle. He hooks it away to the left. BEHIND KANGAROOSAdams attempts his luck on goal and pulls it away to the right. Tarrant has a pot luck shot on goal off the ground and it is a shocker, lucky for him it stayed in and didn't go out on the full. GOAL KANGAROOSMcMillan picks up the loose ball, slams it onto the right boot and finds the goals. North lead by 12 points. Tarrant is on the lead and has got the break on Frawley, but Howe comes back with flight of the ball and slams into him. Cunnington gets a bit of a push and shove over the boundary, there is that slight pause as both fans wait for the free kick that never arrived. Grimes is making his presence felt early on in the game, as the Dees look to put away a top eight opponent. GOAL KANGAROOSGoldstein spots out Bastinac unopposed and gets him, 40m from goal. He comes in and kicks the first goal of the game. Welcome to Etihad Stadium for the clash between North Melbourne and Melbourne. There are no late changes for either side. 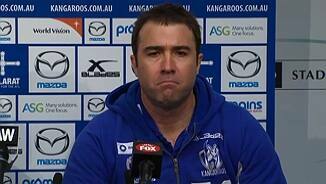 The subs are Campbell for the Roos and Strauss for the Dees.